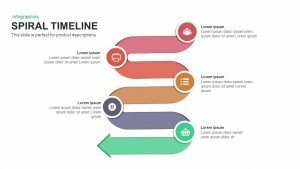 Download spiral PowerPoint templates that are ideal for business process, marketing strategies, business plans, and evolutionary developments. These templates are incorporated with shell-like infographics and color codes that give them an attractive look. 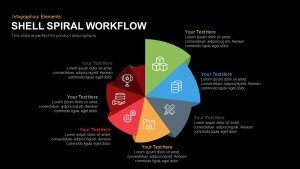 Business professionals use spiral templates for PowerPoint and Keynote slides, marketing executives as well as academic professionals for presentation as well as studies. Any presentation requires maximum participation from the audience, and hence it is essential to make the presentation as attractive as possible. Spiral templates come in both dark and light layout with text placeholders. The template is designed to fit both the aspect ratio 4:3(Normal) and 16:9 (widescreen). Generally, audience prefers easy to understand slides rather than complicated ones because at the end of the day we need clear-cut presentations to convey basic as well complex ideas. So that is why each template is customizable such that user can make any changes according to their needs. You can add as many features to this template so the user needn’t worry if they have complex data in hand. SlideBazaar also has an extensive collection of business templates so that user can choose any templates related to business. Login to SlideBazaar today itself to download premium and free spiral PowerPoint templates and Keynote slides!